They can't see you, but they know where you are. Location: Prospect Park - Meet in the Nethermead. Look for the Come Out & Play balloons. 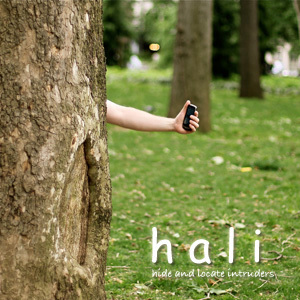 HALI is a team, location based mobile game for your GPS enabled smartphone. Players are divided into 2 teams, Hiders and Seekers. Seekers eliminate Hiders by getting within a close proximity for 30 seconds. Hiders must work as a team to keep each other safe, while seekers must coordinate to lock in on Hiders. The app provides a map, showing other players approximate locations. Seeker are given exact locations of Hiders who are far away, but as they near the hiders, the signal is jammed by the Hider's app. Thus, once Seekers near a target, they must rely on the application less and their eyes more. Hiders must judge when a Seeker is too close and figure out when their location is no longer secure. HALI also provides chat functionality so that teams can strategize with each other, or taught and mislead their opponents. Matt Parker is a new media artist and game designer. He is currently a resident researcher at New York University's Interactive Telecommunication Program. He has been commissioned to make installations for the NY Hall of Science and the NYU Game Center. His work has been displayed at the SIGGRAPH Asia, the Tisch Waverly Gallery, and Sony Wonder Technology Lab. He and his team created the game Lucid, which was a finalist in Android's Developer Challenge 2 and was featured in T-Mobile's Top Picks channel. Xiaoyang Feng is currently a Media Researcher of ITP (Interactive Telecommunications Program). He also works as an interaction designer/developer at Potion Design. His interests focus on human computer interaction, mathmatical aesthetics, organic sculpture and sound visualization. His work has been shown in Gizmodo Gallery, Sony Wonder Lab, Wieden+Kennedy and NIME2010. Corey Menscher is a technologist, interaction designer, and web application developer. Corey is currently a Resident Researcher at the NYU Interactive Telecommunications Program. He graduated from the program in May 2009. His studies have encompassed Physical Computing, Wearable Technology, Computational Media, Social Software, and Mobile Apps & Location-based Services.